You can’t possibly come to Belize and not try a Tamale! 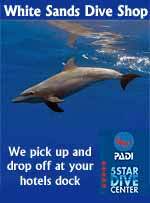 That would be like going to the beach and not getting into the water! 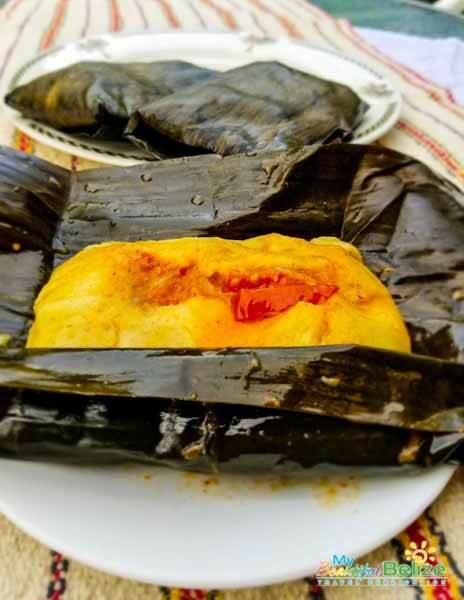 A tamale or bollo is a delicious traditional Mesoamerican dish made of corn dough (masa) which is filled with seasoned meat (chicken or pork) then steamed or boiled in plantain or banana leaves. Tamales have been traced back to the Ancient Maya people, who prepared them for feasts as early as the Preclassic period (1200–250 BC). Maya people called their corn tortillas and tamales both utah. 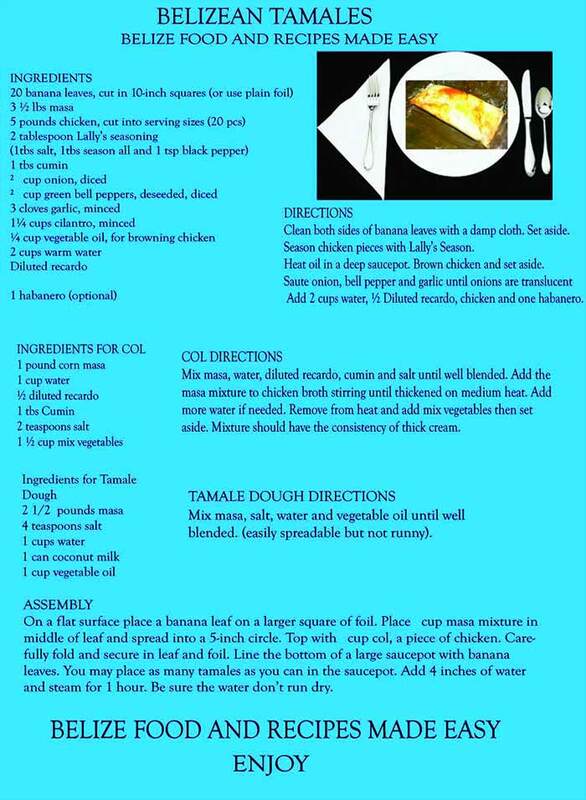 Here is a super yummy, easy to follow recipe provided by: Uj Janal Aj Maya a collection of traditional Maya cuisines by Aurora Garcia Saqui. Roast the leaves directly over a fire or burner on both sides to soften. Cut each leaf into six pieces, three pieces on each side of the vein. Sponge each piece with a damp cloth and set aside. Save the veins for later. In a medium pot, mix the salt, pepper, annatto, bouillon, onion, garlic, and oil. Add the masa and water then bring to a boil, stirring constantly. Remove when it reaches boiling point and set aside. Mix the masa with the oil, adding water until it is as soft as clay. Form into 12 balls. Place each ball on a piece of banana leaf. Flatten each ball into a tortilla shape. Add one teaspoon of the cull to the center of each open tamale. 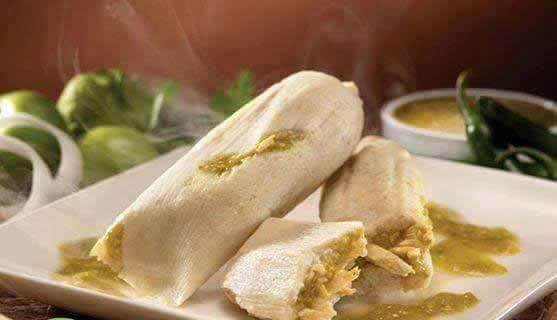 Chicken tamales: Take cooked chicken and add one piece of meat to each tamale. 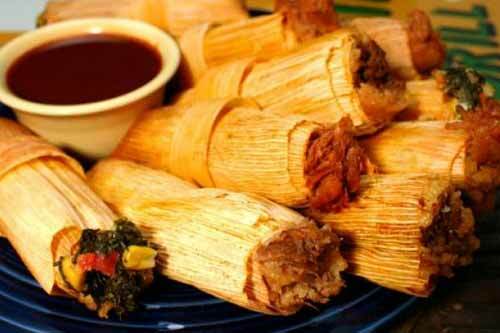 Vegetarian tamales: Substitute chicken bouillon for vegetable bullion and add cooked greens or heart of palm. Fold the masa over the filling, one side and then the other like an envelope. Next, fold the banana leaf over the tamale lengthwise and on the ends (If using foil, wrap a sheet of foil tightly to seal the tamale before steaming). Put the banana leaf veins on the bottom of the pot. Place the tamales on of the veins, and add water, but do not completely cover the tamales, and boil for one hour. Once they have steamed the tamales/bollos will be firm. Let them cool a bit then enjoy! 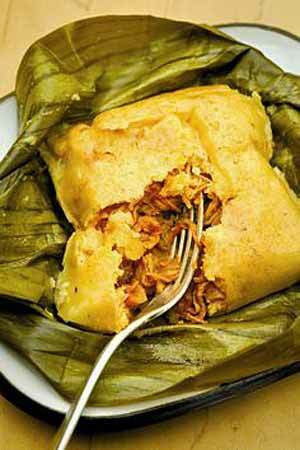 Puerto Rican Pastales are somewhat similar to Belizean Tamales except it's made with green plantains instead of corn. This is a very dense dish, but very delicious. I also show you in 3 minutes or less how to make Belizean Tamales. In a series of snaps by the famous singer just before Thanksgiving, Gwen asked her cook what she is preparing in the kitchen - her response ‘Belizean Tamales’. The snaps reveal a happy Gwen as she sings and sounds excited to try some of Belize’s famous tamales. From stewing the tomato and onions and roasting banana leaves, the Snapchat story reveals the tamale making process in Gwen Stefani’s kitchen; even some empanadas are being prepared. Cinco de Mayo Menu idea. I show you how to make Mexican Tamales in just a few steps. I make 2 types of masa from scratch and red and green salsa. I show you how to make 3 fillings for some the most delicious tamales. 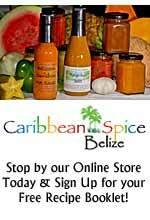 This is an excellent Belizean Tamales recipe made easy. It is broken down into steps for easy to follow instructions. 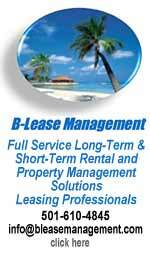 - There are several steps and procedures to follow. - You can do several things at once. You will need 2 packets of corn tamales leaves which are washed and soaked in hot water. When they are to be used, drain them very well. - The leg of pork is put in the pressure pot to be cooked in the 2 lts. of water adding the onion, garlic, cumin and pepper, for 40 minutes from which the whistle of the valve begins to be heard, and the fire is lowered. - When the meat is cooked, it is removed from the broth, thinly sliced &#8203;&#8203;with fork and knife or with the mixer. - Fry with 1 large spoon of lard. Check salt and seasonings to taste. Sometimes it is necessary to add a little more of these ingredients. - 4 cups of Peruvian or pinto beans, cooked and ground. - Fry in 1 tablespoon of lard; 1 cup of 3 chilli sauce: Ancho, guajillo y de árbol , with 1 tablespoon garlic, 1/2 teaspoon ground cumin and 1/4 teaspoon ground pepper. - When the sauce is ready, add the ground beans. - Cook on low heat for 30 minutes until they are soft, that is refried. The broth of cooked meat. - Put the dough in a large bowl. - Add the salt, baking powder, garlic and cumin. 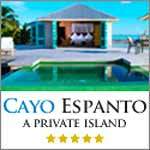 - They integrate very well all the dry ingredients. - Add the hot broth to incorporate perfectly and knead for 10 to 15 minutes until the dough is removed from the bowl and the hands are clean of dough and oil. - Let the dough rest for 15 min. before starting to make tamales. ** Note of tradition. A single person must knead the dough. - If using nixtamalized dough requires less broth to knead. - Ingredients for the sauce of the 3 chiles: for the dough, the meat and the beans. - Perfectly clean the seed chilies, remove the stems, boil until soft. - When cooked the chiles are liquefied with a little clean water. ** Tip: Do not liquefy with the water where they boiled because they are bitter. - Strain the ground sauce to avoid using skin or seeds. We now have ready the meat stew, beans, and dough, and the leaves are soaked. ** Tip.- Remember that the leave has the dough on the smooth side, and the rough side is out. You can make a good amount of leaves with tortilla shaped dough and then proceed to fill with the meat or beans. We put a bed of clean corn leaves that we discard at the bottom. A molcajete is placed in the bottom and we proceed to the accommodation of the tamales around this, as if it were a tipi of Indians; With the open portion of the tamale, facing up. When you finish putting in all the tamales, cover with another layer of tamal leaves and cover with a wet dryer and a plastic bag and cover. They are cooked for 2 hours. Remove 1 tamale, let it cool slightly and taste it. IF IT TASTES COOKED IT IS Ready!! 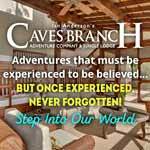 You can now proceed to enjoy of a rich Mexican tradition. Makes 70 to 75 tamales of good size. Clean both sides of banana leaves with a damp cloth. Set aside. Season chicken pieces with salt, Season All, black pepper and sugar. Heat oil in a deep saucepot. Add chicken and cook until light brown. Add 1½ cups water. Dilute recado in approximately &#8531; cup warm water and add to chicken. Let simmer for half an hour, then remove chicken and set aside. Strain chicken broth for col and return to saucepot, reducing to a low heat. Mix masa, water and salt until well blended. Add the masa mixture to broth and stir until thickened. Add water if mixture is too thick. Remove from heat and set aside. Mixture should have the consistency of thick cream. Mix masa, salt, water and vegetable oil until well blended. Mixture will be like a soft custard. On a flat surface place a banana leaf on a larger square of foil. Place &#8531; cup masa mixture in middle of leaf and spread into a 5-inch circle. Top with &#8531; cup col, a piece of chicken and a slice of tomato.olives or green peas are optional. Bring opposite sides of the banana leaf and foil together and fold down tightly. Carefully fold each side over tightly to contain the filling. Line the bottom of a large saucepot with banana leaves. Arrange the wrapped tamales on a slant to avoid water getting into it. You may place as many tamales as you can in the saucepot. Add 4 inches of water and steam for 45 minutes to 1 hour. 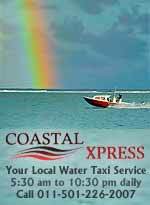 Check periodically to make sure there is always an inch of water in the pot. Allow to stand for 10 minutes before serving. In a bowl add the shortening and soften with your hands until it is creamy. Then add the flour for tamales and salt. Stir and add the chicken broth gradually. Knead until smooth. Add the baking powder and continue kneading, approximately for 30 minutes and let stand for 10 minutes. To shape the tamales, take a leaf of corn and put mixture of tamales, add the stuffing of chicken in the center and close the ends of the leaf and close with a strip of corn leaf. Place in a vertical pan in a pot or steamer, cover with corn leaves and let cook for about 1 hour. Cut the ears through the thickest end, remove the corn and grind it. Soak the leaves in warm water until they soften. In the blender empty the milk and the melted butter, start blending and gradually add the corn kernels until a homogeneous paste is obtained. Add salt, baking soda, sugar and cinnamon. Blend until all is integrated (if necessary, pour two or three tablespoons more milk). Dry the leaves and `double ', add a tablespoon of dough and fold the sheets to wrap it. Arrange the tamales in a circular way inside a steamer and cook over medium heat for 45 minutes to 1 hour, or until when opening a tamale, the dough will easily peel off the leaf. Blend the cloves, peppers, garlic, cumin and chiles, with their cooking water, strain and set aside. In the hot oil stir the onion and add the tomato when onion is well cooked. Add the meat, a little liquefied chile, olives and chilies in jalapeno slices, let it season very well and finally add the carrot and the potatoes and leave to boil a little, just to finish cooking inside the tamale. Make a tortilla with the dough, fill with the meat mixture, and close the tortilla and fold it in a plaintain leaf, tie them to keep the tops upright and leaf closed and steam it for an hour. In a saucepan, add the corn flour, baking powder and baking soda, add the butter and mix until it forms a dough. Add the broth of the meat, the chile pepper that you reserved and knead to give it consistency. Note: the broth of the meat must be well seasoned so that the dough does not remain tasteless. The meat is cooked with salt, onion and a clove of garlic. Dilute the dough in the water and strain it through a cheesecloth; Let it rest and when the mass has settled on the bottom of the container, drain the water. Heat the butter and strain it over the dough, stir well with the latter and salt to taste. Cool completely. Spread a little dough on each banana leaf, add the filling, fold the leaves into rectangles, tie with a strip of the banana leaves, arrange them lying in a steamer or a tamale pot, and cook for an hour or so. Until they are easily detached from the banana leaf. Cook the meat with the roasted garlic cloves, salt to taste and water to cover. Grind the achiote with the peppers and broth. Add to the above when you release the boil. Let it boil until the meat is soft and the broth is reduced, then add the tomato and the epazote and salt test. Once the sauce has thickened and the tomato is well cooked, remove from the heat. Crumble the meat and mix with a little sauce. Blend everything until totally blended. Boil the chicken meat in a saucepan with water and salt until smooth. Meanwhile, toast the peppers in a bowl over medium heat and stir in hot water until smooth. Blend together with the garlic and cumin. Heat 1 tablespoon butter in a saucepan over medium heat and pour the sauce above; Fry for a few minutes. Thin the chicken meat and add it to the sauce. Cook for a few minutes. Beat the remaining butter in a large bowl until it is fluffy. Add the baking powder, salt, chicken broth and flour; Continue beating until all ingredients are incorporated. The dough will be ready when a ball of the same can float from a glass with water. 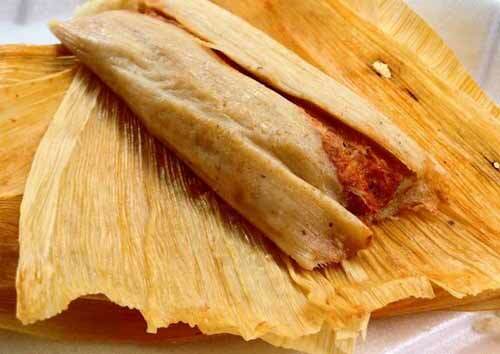 To make the tamales, put 2 tablespoons of dough and 1 tablespoon of filling in each sheet of tamale. Fold the tamales well and arrange them on the grill of a steamer with boiling water. Cover and cook until the tamale is easily peeled off the sheet, about 1 hour. The leaves should be soaked in hot water for several hours to make them soft and manageable. Be sure to soak them and drain them in time. You can use shredded pork instead of chicken. 1.- Prepare the mole as indicated in the packing instructions; Add the ABUELITA® Table Chocolate, 2 tablespoons of meat and the pork. 2. Beat the butter until it is white and fluffy; Add the tortilla dough, Evaporated Milk and the two tablespoons of Chicken and continue to beat until a piece of dough floats in a glass of water. 3 .- Spread a little dough on the banana leaf and, in the center, put a tablespoon of mole. Fold carefully to avoid filling. 4.- Steam cook for 30 minutes on average fire. 1. Place the meat and 4 cloves of garlic in a large pot. Cover with water and heat over high heat until it boils. Reduce heat to low, cover and cook for 3.5 hours or until meat is soft enough to easily break it. Remove the meat from the pot, strain the broth and discard the garlic. Reserve 5 broth cups. Finely shred the meat with the help of two forks. 2. Place the corn leaves in a large bowl and cover with warm water. Let soak for 3 hours or until soft and supple. If necessary, place a heavy object on the corn leaves to soak them evenly. 3. Toast the chiles anchos in a frying pan or comal to moderate fire, taking care that they do not burn. Let cool and grind in a molcajete or food processor. 4. Heat the oil in a large saucepan over medium heat. Add the flour and let it lightly brown. Add 1 cup commercial broth, mixing to thaw the lumps. Add ground chilies, ground cumin, chopped garlic, oregano, shredded chilli and vinegar. Mix everything very well, season with salt to taste and incorporate the shredded meat. Top and cook over low heat for 45 minutes. 5. Place the lard and 1 tablespoon of salt in a large bowl. Beat with electric mixer at high speed until smooth. Add cornmeal and beat at low speed until fully blended. While still beating, add the 5 cups of the broth in which the meat was cooked. 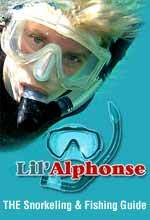 Continue beating until smooth and smooth, slightly damp. 6. Drain smoothed corn leaves very well. Place about 2 tablespoons of dough on each corn leaf and add 1 tablespoon of the stew in the center of the dough. Fold the tip of the corn leaf over the landing, then close the sides. If desired, tie the tamale with thin strips of corn leaves, but do not over tighten it. Back in the late 1930s and the early 1940s, my parents would often drive to Montebello in California to buy tamales from a market where the building was shaped like a giant tamale. I can’t remember much about their tamales accept there was a cornhusk with a dough filled with some kind of meat. What is a tamale? It is generally a meat filling surrounded by dough. The dough is called “masa harina” and is made from white corn flour mixed with lard and a meat broth. The masa is spread out on a cornhusk or banana leaf – each present a difference taste to the tamale – and filling is spread on top of the masa. The mixture is folded over, thus filling is surrounded by the masa. The cornhusk or banana leaf is tied and is placed in a steamer and steamed for three or more hours. Masa harina is available in many supermarkets. Today, in most Mexican restaurants, the tamales are about two ounces. I like to call them border tamales. When I lived in Texas I called them TexMex tamales. In San Antonio I went to the tamale factory where some were handmade. Once you go south of the border, tamales are all different. 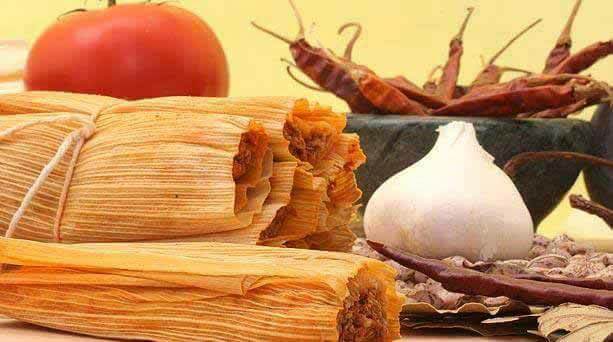 Tamales originated in Mexico by the Mayans in about 1,200 BC. The Aztec, Olmeca, and Tolteca moved south into the Inca Empire and all along the way different countries made their own version of the Mayan tamale. Tamales are eaten for breakfast, lunch, and dinner. In Mexico, the first tamales came from the Yucatan, and as in most tropical countries, wrapped in banana leaves. 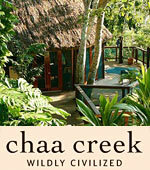 Other areas used cornhusks, while in some regions, chard or avocado leaves are used. During pre-Columbian times, the Aztecs filled them with turkey, fish, frog, gopher, rabbit, eggs, bees, honey, squash, and/or beans. Can you imagine eating tamales made with gopher meat? The most popular tamale made in Mexico is filled with pork, onion, garlic, jalapeño chilies and salt, and wrapped in cornhusks. Today, visitors to the Yucatan will find tamales filled with pumpkin seeds, cooked eggs, and chard wrapped in a banana leaves. My favorite Mexican tamale comes from Oaxaca, filled with chicken, onions, garlic, and black mole wrapped in banana leaves and formed into a square. Mole is a mixture of three kinds of chilies, garlic, onions, cloves, cinnamon, anise, black pepper, prunes, chocolate, almonds, sesame seeds, plantain and raisins. In Central America, tamales are found in all of the countries. Some of the tamales have no filling and is eaten like bread. In Guatemala there are hundreds of varieties with the most popular filled with chicken or pork and tomatoes. 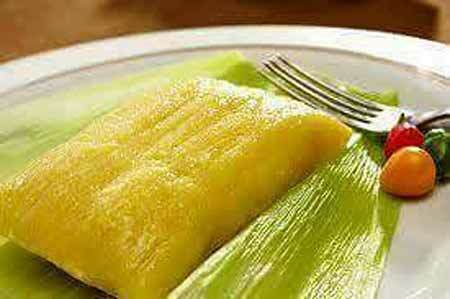 In El Salvador they make sweet tamales filled with brown sugar, cinnamon, nutmeg, butter, and fruit with pineapple – my favorite fruit. They also make chicken or pork tamales, some filled with chickpeas and/or potatoes. 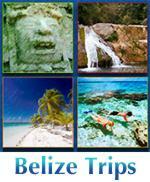 In Belize, tamales are called “bollo” and are green corn tamales. 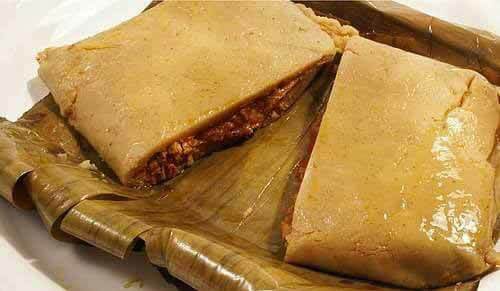 In Nicaragua they make the largest tamale called “nacatamales.” This is my favorite tamale. The filling has pork, rice, potatoes, onion, bell peppers, tomatoes and mint. Some cooks add other ingredients such as cooked black beans, canned chickpeas, and olives, to name a few. In Honduras, their tamales are similar to Nicaragua; however their favorite tamales are sweet tamales similar to those made in El Salvador. 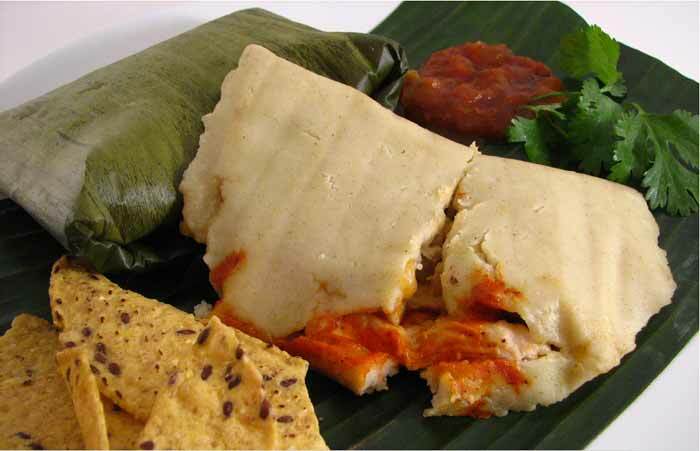 In Costa Rica the tamales are called “deaf tamales” and are served during the holy days and other special occasions. They are filled with chicken, pork, or beef, and garlic, sweet or hot peppers, onions, rice, and potatoes. These tamales are generally not spicy, however, has a bit of cumin, achiote, and black pepper. In Panama the tamales are filled with chicken, raisins, onions, and tomato sauce. Not all countries in South America have tamales. Some have a food that looks like tamales and has different names. In Argentina, tamales are filled with lamb or pork. Also, they make another version called “huma” that can be either sweet or savory and are not considered tamales. However they look and taste like a tamale. In Peru and Chile they make “humayas” filled with onions, cream cheese, red pepper, corn, butter, basil, and green chilies. They are wrapped in cornhusks. 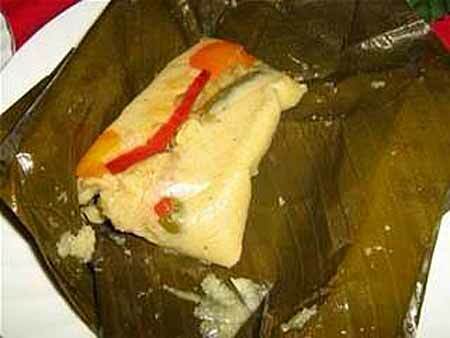 In Peru and Bolivia their tamales are spicy, large, wrapped in banana leaves. In Lima the filling is chicken or pork with boiled eggs, olives, peanuts and hot chilies. In the smaller cities the tamales are smaller. 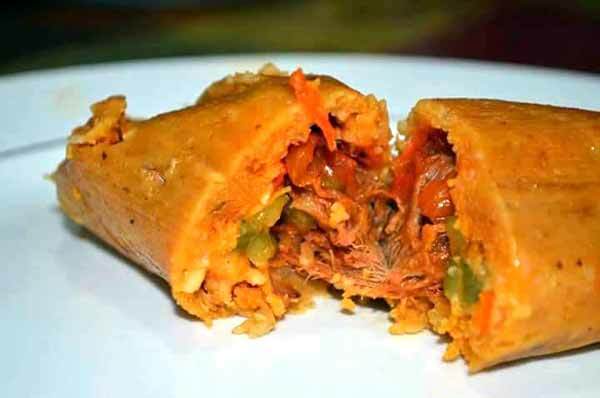 In Brazil they make a food called “pamonka.” It is not a tamale, but looks like a tamale. 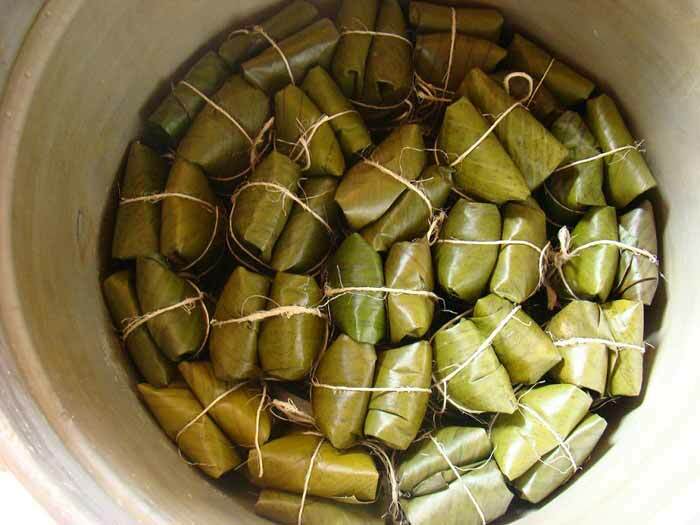 In Venezuela, tamales are called “hallacas.” They are wrapped with banana leaves and filled with stewed pork, raisins, chickpeas, tomatoes, bell peppers, parsley and stuffed olives. They also make “bolos” that are similar to tamales, wrapped in cornhusk, filled with hot peppers and served as a side dish. 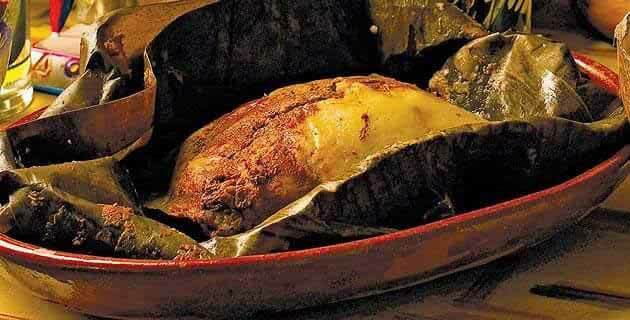 In Colombia, tamales are wrapped in banana leaves and are known as “tolimense” and shaped into ball about the size of a baseball. The filling is chicken, pork, green onions, garlic, tomatoes, cilantro, carrots, green peas, boiled eggs and potatoes. In Ecuador the tamales are called “humitas” and are filled with pimento-stuffed green olives, boiled eggs, red bell peppers, garlic, cheese, chicken, pork and raisins. The masa is made with eggs, butter and lard, sugar, peanut butter, and seasoned with allspice and black pepper. Tamales are found in other parts of the world, such as Spain and the Philippines and are made with local ingredients. I used the stew pork from the last video to make our savory Belizean Pork Tamales. 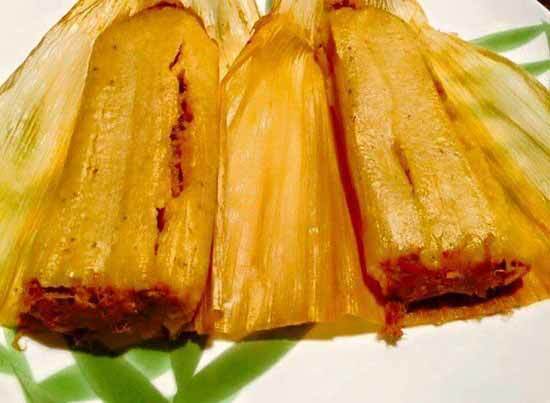 This tamales recipe is easy to follow and you will get it right each time. I even learned how to prepare the banana leaf and wrap the tamales the right was. Plantain leaves, Banana leaves or aluminum foil. For state-side folk: Plantain leaves can often can be found in ethnic grocery stores, look for: Pacific Islander, Thai, or Mexican stores. Cook chicken or other meats like you are making Stewed Chicken with Recado. Cut up chicken into at least 10 pieces. Set chicken aside. Keep broth - it becomes the base for the Cull. Make Masa: In a large bowl combine flour, oil (or lard), and salt. Slowly add water and mix to make a thick mound of corn dough. Corn dough needs to be soft and spreadable, but not sticky. Four pounds of Maseca makes about 25 to 30 corn dough shells. Masa can be covered with plastic wrap and set aside. Make Cull: Take the broth from cooking the chicken, strain out any pieces. Add 1lb Maseca Corn Flour, and stir to prevent lumps from forming. Bring to a boil, let boil 3 minutes and then turn off heat. Prepare Plantain leaves: Boil water, submerge leaves. Removed from boiling water and wipe dry with a cloth. Cut into 12×12 inch sheets. Prepare the Masa: Pull fist-sizes pieces of dough off, and roll into fist-sized balls. Flatten each corn dough ball with the Maricona (a tortilla press) or by hand. Place flattened Masa ball on Plantain leaf. Keep in mind, you are going to fold the leave with the grain of the leaf. Start assembling the tamales! On a large table layout all the vegetable ingredients in bowls along with the Cull, Chicken pieces, and flattened masa on plantain leaves. Place a scoop (1/2 cup) of Cull in the center of the flattened masa. Then add pieces of chicken, a spoonful of green peas, onion slices, green pepper slices, tomatoe slices, cilantro, and a small scoop of habanero. Fold the tamale: Fold the tamales along the grain of the plantain leaf in half. After folded in half fold 3 sides of the plantain leave to contain all the ingredients. This can be tied with strips of plantain leaf, or it can be wrapped in a sheet of aluminum fold to keep it from unfolding. Steam tamales: Stack packages in an extra large steamer pot. Add water and steam for one hour. Habanero peppers can range in heat. We would recommend cutting your peppers into slices. Slices will still deliver flavor to the tamale, but if the pepper slice contains nuclear levels of heat, it can be removed while the tamale is being eaten. Growing up in a Mestizo household, these pockets of masa filled with chicken, k’ol and some veggies were a favorite for many special occasions, from birthdays to New Year’s parties. With my aunt and grandma in the lead, my cousins and I had the little tasks of gathering the plantain leaves needed to wrap the tamales and washing and chopping the onions and tomatoes needed for the sauté. I would watch in wonder at the careful process of making this one dish, and of courses, enjoyed eating them hot out of the pot when they were ready! Just shy of the New Year I got nostalgic for the foods I grew up eating and thus, our My Beautiful Belize family decided to make tamales! It was quite an experience for Tamara, Mary and I, working in the kitchen all day while sipping on tasty, yet non-traditional cranberry margaritas. While making tamales can be a bit time consuming, the steps are rather easy, and that’s where teamwork comes in! The ingredients are easily found at your local grocery store. Here is our recipe so that you too, can have fun cooking with the family!